In After the Storm: The World Economy and Britain’s Economic Future, Vince Cable, former Secretary of State for Business, Innovation and Skills (2010-15), reflects on the state of the British economy since the financial crisis. The book explains the policies introduced to restore the economy during the coalition years and offers recommendations to ensure future long-term growth and to stimulate productivity. LSE academic Swati Dhingra welcomes the book as an illuminating behind-the-scenes account of Cable’s experiences in government with policy insights that will be of relevance for many years to come. On Wednesday 2 December 2015, Vince Cable will be speaking at the official launch event of the LSE Business Review blog as part of a panel of economists discussing the question of ‘How Can the UK Improve Productivity and Still Build the Workforce?’ . After the Storm: The World Economy and Britain’s Economic Future. Vince Cable. Atlantic Books. 2015. This has been a self-congratulatory year for the British economy. On 1 January 2015, The Financial Times announced that Britain’s recovery is ‘secure’ and will ‘continue at a good pace’. There is reason for relief in Britain – unemployment is low and GDP isn’t shrinking: healthy statistics compared to many European neighbours. But the celebratory cheers are misplaced. This is the slowest recovery for a century. The unemployment numbers hide the fact that real wages are at least 8% lower than pre-crisis levels and per capita GDP is 16% lower than what we would expect from pre-crisis trends. A sunny view of the situation is that this could all turn around if the economy continues to recover at a good pace. But productivity growth – rise in output per worker – has failed to recover after the crisis. So where will the good jobs come from? Few politicians are willing to dampen the mood by bringing up the question of long-term growth. This is why Vince Cable’s After the Storm: The World Economy and Britain’s Economic Future is a book that pushes the public debate forward. It acknowledges the systemic sources of low productivity and discusses policy directions to address them. Vince Cable was the Secretary of State for Business, Innovation and Skills from 2010 to 2015 in the coalition government of the Tories and the Liberal Democrats. At the start of their term, the economy was still fragile and recovery from the financial crisis was tenuous. The government soon introduced policies designed to kickstart economic growth while keeping public spending in check, including setting up a British Business Bank to cater to smaller enterprises, hiking tuition fees for higher education and expanding apprenticeships. This is a tall order for any government, let alone a coalition government stepping in after the greatest financial crisis in post-war history. 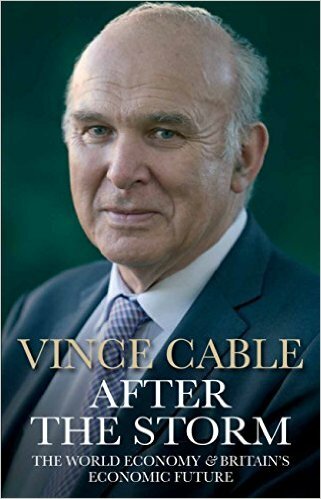 It is no surprise then that Vince Cable has been given many different names – a voice of reason; a ‘semi-academic lofty lefty anti-Tory whimsy’; the worst business secretary; a true friend of British business. What is remarkable is that he has been called all these names by all political groups – left and right. Cable had an important job at an important time, manoeuvring policy in a coalition government at an economically pressing moment in history. The book provides his overview of the British economy since the crisis and identifies areas for policy action to promote growth. It offers a small window into the divisions within the government over policies. But it is not a Sunday afternoon read – there are no tantalising scandals here, no house of cards or even wild criticisms. The book is written with a vision for Britain’s economic future. It is a self-contained sequel to The Storm: The World Economic Crisis and What it Means (2009), which described Britain during the financial crisis. After the Storm explains the policy choices that were made to restore the British economy during the coalition years. Cable is not afraid of championing himself as an architect of Britain’s post-crisis industrial strategy. Industrial strategy is a sullied phrase in economics, reminiscent of political meddling and self-aggrandisement in inefficient state-controlled economies. His semi-academic lefty point is that governments all over the world have active industrial policies that aim to overcome the short-termism of markets, and many path-breaking innovations are a direct result of government intervention through support for R&D (Research and Development). This vision is embodied in the policies recommended by the book, which include doubling the innovation budget, promoting apprenticeships instead of ‘graduate factories’, picking sectors for specific policy support and checking house price inflation because it crowds out productive investments. These ideas have economic backing, and take on board the recommendations of non-partisan bodies such as the LSE Growth Commission. The coalition government introduced many of these policies in small degrees. The legacy has persisted, although in evolving and intermittent ways. And there is no doubt that Cable contributed to turning industrial policy from a lofty lefty ideal into a fashionable plan that appeals even to the new fiscally conservative government. Industrial policies are sustainable and equitable only if they deliver on raising productivity. So a vital part of industrial policy is to build in checks and corrections to ensure efficacy. This is where the book is low on details, and we might have to wait until Cable writes Many Years After the Storm to learn more about this. While Cable’s view on industrial strategy is unconventional, he strongly advocates the conventional view of the economic gains from openness. Most trade economists agree that globalisation brings economic gains, but there is a growing recognition that it can also hurt certain segments of the population. The US is the best example, where recent work finds that import competition from Chinese firms contributed towards a decline in manufacturing employment, leading to many displaced workers resorting to disability benefit programmes. Britain would be less likely to suffer from such inequities if productivity growth were to create new jobs. But Cable’s reasoning for maintaining openness is more nuanced. His insight is that globalisation based on clear rules is being undermined by the politics of identity. High emotion and divisive politics determine cross-border policies. In these times of Brexit and immigration fears, the chapter on globalisation provides a cautionary tale that identity politics could make Britain a closed society. It is easy to see why Cable evokes divergent name-calling by all parties – he recognises the need for a strong competition policy in an open economy. The cross-border policies in the book, though, do not anticipate the challenges that will emerge for industrial policymaking as economies pursue deep integration through behind-the-border rules, which are already part of big trade agreements. After the Storm is a synopsis of the state of the British economy today. Productivity in Britain remains 30% below the US, France and Germany. So the problems the book highlights will stay with us for the foreseeable future. This behind-the-scenes account of Cable’s experiences in policymaking and future evidence on the performance of the policies will keep the book relevant for many more years to come. Swati Dhingra is an Assistant Professor at the Department of Economics at LSE. Before joining LSE, Swati completed a PhD at the University of Wisconsin-Madison and was a fellow at Princeton University. Her research interests are international economics, globalisation and industrial policy. Her work has been published in top economic journals including The American Economic Review. She is Associate Editor of the Journal of International Economics, and was awarded the FIW Young Economist Award and the Chair Jacquemin Award by the European Trade Study Group for her work on firms and globalisation. Swati is a member of the Globalisation group at the LSE’s Centre for Economic Performance, and has made regular contributions to work on economic policy.